Our charming purse compact mirrors are sure to be the hit of the party. 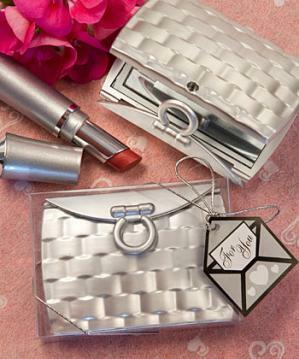 Each purse compact mirror favor measures 3.25" x 2.25" and is made with a shiny silver color, hard molded plastic outer compact cover in an adorable woven-look purse shape with an overlapping hinged snap opening that reveals a dual-sided mirror interior. Guaranteed to be an instant favorite, each comes in a clear acetate box, tied with a silver string and an attached silver letter shaped "For You' tag with heart designs.